Export all your cars / vehicles to a CSV file with a single click! 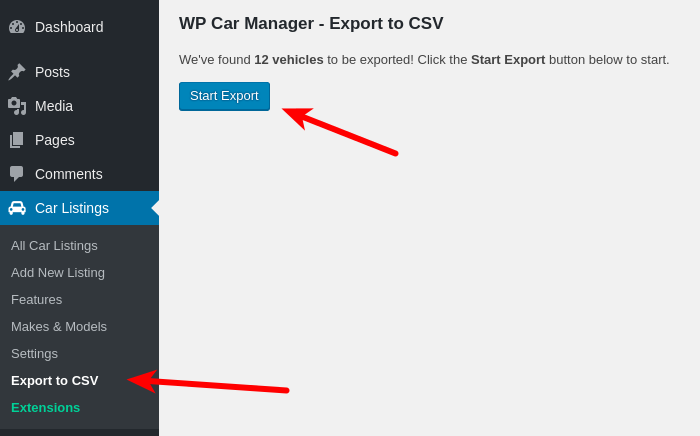 The CSV Exporter exports all cars including features, makes, models and all car data to a CSV file! The exported CSV is importable with the CSV Importer Extension (to be released soon). After installing the extension head over to Car Listings > Export to CSV. This screen will show you how many cars are found that can be exported. Click the Start Export button to generate and download the CSV file. You can expand the default set of fields that are exported by the CSV Exporter Extension with custom meta data. The key of the array is the database meta field and the value is the label you want to use in your CSV file. You can use the wpcm_ce_extra_fields_vehicle_meta filter to add the custom meta fields. Is there an extension available for importing the CSV file? Not yet but we're working very hard to have this available very soon. Be sure to subscribe to our newsletter so we can notify you once the extension is released!